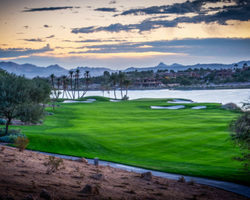 Reflection Bay Golf Club is set on luxurious Lake Las Vegas, located 15 minutes east of the Las Vegas Strip. A 320 acre man-made lake, Lake Las Vegas is the centerpiece of this high-end residential resort community. Built in 1998, Reflection Bay Golf Club was designed by 18 time Major winner Jack Nicklaus. The course is designated as a prestigious Jack Nicklaus Signature Design, the only such course located in the state of Nevada. Reflection Bay played host to the Wendy’s 3Tour Challenge from 1998 to 2007, showcasing the talents of such champions as Bubba Watson, Fred Couples, John Daly and Phil Mickelson. Just as revolutions mark turning points in history, the Revere at Anthem is a turning point in Las Vegas Golf. The Revere presents a blend of beauty and challenge unlike any other in southern Nevada. The secret to this lies in the careful manner its tees, fairways and greens were draped through the rugged desert canyons and valleys of the Las Vegas foothills. As a result, The Revere offers unending awe inspiring views of the city below and the mountains beyond. The course is located 15 minutes from the Las Vegas strip. The Revere presents a blend of beauty and challenge unlike any other in Southern Nevada. Draped through the rugged desert canyons and valleys of the Las Vegas foothills, The Revere offers unending, awe-inspiring views of the city below and mountains beyond. And, the stunning Lexington and Concord courses will test your shot making capabilities with classic risk/reward scenarios, and provide you with a variety of options to accommodate your game, regardless of skill level. Welcome to Angel Park Golf Club, the "world's most complete golf experience." At almost 3000 feet in elevation, Angel Park offers spectacular views of Red Rock Canyon and the Las Vegas Valley. Angel Park Golf Club features 36 holes of championship golf designed by the legendary Arnold Palmer, the lighted Cloud Nine Short Course and the world's original natural grass Putting Course. The Mountain Course is desert golf at its finest. Winding through the rolling natural terrain and skirting dense stands of native vegetation, this course is at an elevation of 2,800 feet and features panoramic views of the Spring Mountains, Red Rock Mountains and the Las Vegas skyline that are simply spectacular.